WHAT WE KNOW? The truth is out there. And by that I mean there is a 21 minute featurette of the revival. Other interesting things to keep in mind, Joel McHale is on it! Unconventional – very exciting – casting. And the show will keep the structure of stand-alone cases mixed with mythological episodes. I have a shocking confession. I didn’t watch The X-Files. I was only a kid when it premiered and even though most people I knew watched it, my mother had some sort of prejudice against TV shows of the supernatural/fantasy flare [I have since converted her. She watches GoT now]. By the time I became aware of my sin of omission, the show was in season 7 or something and I never jumped on board. Since then I have been attempting to stream it but…. You know… there are a lot of episodes. And so… the biggest hole in my TV experience was created. Bear in mind that I am really into sci-fi, and this is probably one of the most important seminal shows on the genre. I wish I could use this opportunity to catch up, but there are only so many hours in the day! So? Are you part of the rare breed of X-files virgins? Fear not. I have a plan. I refuse to miss out on the cultural phenomenon that is The X-Files, once more. So I am determined to get into it. 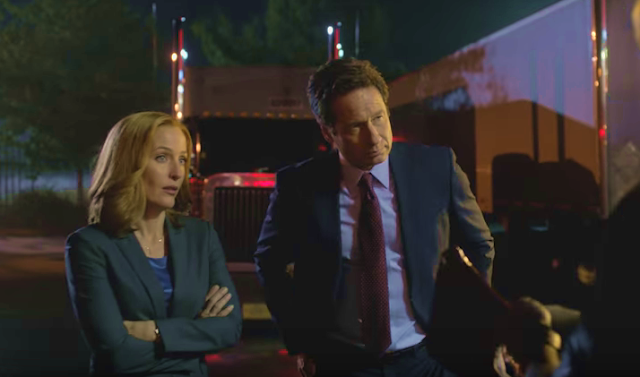 Some basic knowledge is required: We have Mulder and Scully and they work for the FBI. They investigate paranormal phenomena. Scully tends to be an skeptic, Mulder has an open mind. Since I won’t be able to catch up on nearly a decade of mythology, my plan is to just dive into the new season. Presumably there will be enough new stuff that I can follow, however I will probably miss most of the references. Sometimes a reference is obvious and the answer is easy to find in Wikipedia [sometimes I need to do this with shows I’ve watched!] After the new episodes end, I expect to be confused and intrigued. Perfect mood to FINALLY stream the gazillion episodes that came before. At least I will have a better feel of the show and characters and hopefully the task will seem less daunting.